7451. “Legals,” Katlyn Augustine Hankla, Coeur d’Alene/Post Falls Press, Coeur d/Alene, ID, June 27, 2014, http://www.cdapress.com/archive/article-b7e94db6-a...aa-f15478d77bb1.html. 7452. “Records -- Marriages,” Katlyn Augustine Hankla, Coeur d’Alene/Post Falls Press, Coeur d/Alene, ID, November 11, 2016, http://www.cdapress.com/archive/article-b7cadf62-3...20-85366b7d3e4d.html. 7454. “Alvin Jason Ames,” Find-A-Grave, https://www.findagrave.com/memorial/188802512, 188802512. 7455. “Evelyn Ames,” Find-A-Grave, https://www.findagrave.com/memorial/188802427, 188802427. 7456. “Private Interview,” October 6, 2018, Richard Webb. 7457. “Obituaries,” Sydney Bruce Abrahamson, Calgary Herald, Calgary, AB, Canada, October 10, 2009. ABRAHAMSON, Sidney Bruce Beloved husband of Nita, passed away peacefully on October 7, 2009 at the age of 82. He is lovingly remembered by his children: Douglas, Carman, Nancy, Earl (Tamara); and grandchildren: Ryan, Kendra, Danielle, Jordan, Lori and Micheal. He will be greatly missed by numerous other relatives and friends. Sid was born December 23, 1926 in Norquay, SK. He married Nita in October 1955. He moved to Calgary in 1959 to work at Standard General and raise his family. A Celebration of Sid's life will be held in the Chapel of MOUNTAIN VIEW FUNERAL HOME on October 13, 2009 at 2:00 p.m. In lieu of flowers, if so desired, a memorial tribute may be made in Sidney's name directly to the Calgary Humane Society (4455 - 110 Avenue S.E., Calgary, AB T2C 2T7). To email expressions of sympathy: mountainview@arbormemorial.com Subject heading: Sidney Abrahamson. Arrangements entrusted to MOUNTAIN VIEW FUNERAL HOME and CEMETERY, 1605 - 100 Street S.E. (17 Avenue S.E. at Garden Road), Calgary, AB. Telephone: 403-272-5555. www.mountainviewmemorial.ca . 7459. “Rose Catherine Hales Lupaschuk,” Find-A-Grave, https://www.findagrave.com/memorial/131424496, 131424496. 7460. “Wasyl Lupaschuk,” Find-A-Grave, https://www.findagrave.com/memorial/131424499, 131424499. 7461. “Elizabeth Donohoe,” Find-A-Grave, https://www.findagrave.com/memorial/73450428, 73450428. 7462. “Mary L Shake Donohoe,” Find-A-Grave, https://www.findagrave.com/memorial/108812291, 108812291. 7463. “Mary Veronica Donohoe Mac Curdy,” Find-A-Grave, https://www.findagrave.com/memorial/104693073, 104693073. 7464. “William Irwin Mac Curdy,” Find-A-Grave, https://www.findagrave.com/memorial/104693001, 104693001. 7465. “Thomas E Donohoe,” Find-A-Grave, https://www.findagrave.com/memorial/108812259, 108812259. 7466. “Death Notices,” Vernoica M MacCurdy, The Pittsburgh Press, Pittsburgh, PA, February 9, 1988, 16. 7467. “Death Notices,” Sarah Donohoe, The Pittsburgh Press, Pittsburgh, PA, April 10, 1970, 24. 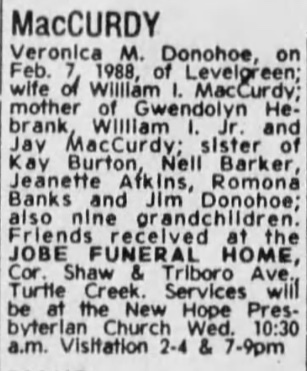 On Tuesday, April 7, 1970, Sarah Donohoe of 351 Negley Ave., Turtle Creek, beloved wife of William and mother of Mrs. Mary Ellen Lovis, William Jr. and Gregory; daugther of Mrs. Mary Donohoe and sister of Mrs. Vernoica MacCurdy, Mrs. Kathleen Burton, Mrs. Ellen Barker, Thomas E., Mrs. Jeanette Adkins, Mrs. Romana Bank and James. Funeral from the JOHN L. QUINLAN FUNERAL HOME, 11th & Airbrake Ave., Turtle Creek. Requiem mass in St. Colmans Church Saturday at 10:30 a.m.
7468. “Death Notices,” Mary Ellen Donohoe, The Pittsburgh Press, Pittsburgh, PA, September 17, 1975, 70. 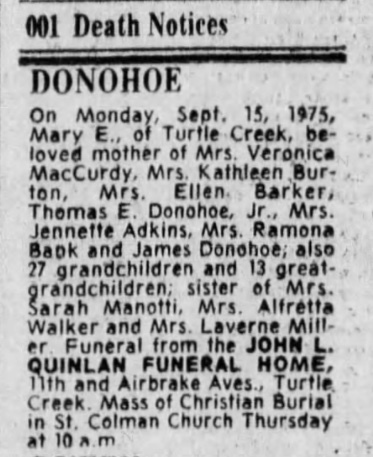 On Monday, September 15, 1975, Mary E., of Turtle Creek, beloved mother of Mrs. Vernoica MacCurdy, Mrs. Kathleen Burton, Mrs. Ellen Barker, Thomas E. Donohoe, Jr., Mrs. Jennette Adkins, Mrs. Ramona Bank and James Donohoe; also 27 grandchilrden and 13 great-grandchildren; sister of Mrs. Sarah Manotti, Mrs. Alfretta Walker and Mrs. Laverne Miller. Funeral from the JOHN L. QUINLAN FUNERAL HOME, 11th and Airbrake Aves., Turtle Creek. Mass of Christian Burial in St. Colman Church Thursday at 10 a.m.
7469. “Sarah Burchell,” Find-A-Grave, https://www.findagrave.com/memorial/167296472, 167296472. 7470. “William A Burchell,” Find-A-Grave, https://www.findagrave.com/memorial/167296509, 167296509. 7471. “Ramona Bank,” Find-A-Grave, https://www.findagrave.com/memorial/174882409, 174882409. 7472. “Tyrone Bank,” Find-A-Grave, https://www.findagrave.com/memorial/174882410, 174882410. 7474. “Sylvia Larson,” Find-A-Grave, https://www.findagrave.com/memorial/193755368, 193755368. 7475. “Marvin Victor Larson,” Find-A-Grave, https://www.findagrave.com/memorial/38786463, 38786463. 7477. “Tanys Marie Anderson,” Find-A-Grave, https://www.findagrave.com/memorial/187912231, 187912231. 7478. “Obituaries,” Tanys Marie Anderson, The Calgary Herald, Calgary, BC, Canada, March 14, 2004, 79. Tanys Marie Anderson of Calgary passed away suddenly but peacefully at the Foothills Medical Centre on Thursday, March 11, 2004, with many family members and friends at her side, five days after celebrating her 33rd birthday. Tanys enjoyed softball, skiing and spending time with family, friends and her two cats. Her bright blue eyes, infectious smile and warm personality will be missed by all. Tanys is survived by very special friend and soul mate, David Genoway; her mother Sandy Anderson; sister and brother-in-law, Heather and Kevin Slusarenko; and her father and step-mother, Gary and Norma Anderson. Sharing their grief are Lola and Erhart Nagel, Grandma Anderson, Eve Nielson, Kara and Dwayne Fenton, Leslie and Robert Enz, Bernie and Gladys Evans, Janice and Brian Mokray, Sharon and Darrel Metz, Jim and Annette Waletsky, Penny Colvin and Mike Eisner, Jen and Kathy, Auntie Linda, and extended families and many friends past and present. Tanys was predeceased by Grandpa Anderson and Grandpa Waletsky, Bobbi-lee and Gregory Anderson, and by Donna Summers. Those wishing to pay their respects may do so at McINNIS & HOLLOWAY’S Fish Creek Chapel (14441 Bannister Road S.E.) on Monday, March 15, 2004 from 6:00 to 8:00 P.M.
Funeral Services will be held at McINNIS & HOLLOWAY’S Fish Creek Chapel (14441 Bannister Road S.E.) on Tuesday, March 16, 2004 at 3:30 P.M. To forward condolences go to www.mcinnisandholloway.com. If friends so desire, memorial tributes may be made directly to the Calgary Humane Society (S.P.C.A. ), 1323 – 36 Avenue N.E., Calgary, AB T2E 6T6.Telephone: (403) 250-7722 ext. 309, or directly to the Southern Alberta – Hope Program, c/o Foothills General Hospital, 1403, 29 Street South N.W. Tower, Room 809, Calgary, AB T2N 2T9. In living memory of Tanys Anderson, a tree will be planted at Fish Creek Provincial Park by McINNIS & HOLLOWAY FUNERAL HOMES, Fish Creek Chapel, 14441 BANNISTER ROAD S.E., CALGARY, TELEPHONE: (403) 256-9575. 7479. “Jacob Waletzky,” Find-A-Grave, https://www.findagrave.com/memorial/177793072, 177793072. 7480. “Thomas E Donohoe,” Find-A-Grave, https://www.findagrave.com/memorial/117722434, 117722434. 7481. “Floyd Jefferson Chapman,” Find-A-Grave, https://www.findagrave.com/memorial/42605320, 42605320. 7482. “Geraldine Holthues Chapman,” Find-A-Grave, https://www.findagrave.com/memorial/42605318, 42605318. 7483. “Obituaries,” Floyd J Chapman, The Billings Gazette, Billings, MT, April 2, 1971, 8. THERMOPOLIS, Wyo.—Floyd Jefferson Chapman, 71, died Wednesday at his home. He was born Sept. 10, 1899 at Greybull, Wyo., a son of Mr. and Mrs. Jefferson Chapman. He married Geraldine Holthues March 3, 1926 at Billings. They moved to Thermopolis in 1928. Mr. Chapman worked as a heavy equipment operator for Hot Springs County until he retired in 1962. Survivors include the widow; a daughter, Mrs. Grace Jesse, Pocatello, Idaho; a sister, Mrs. Dora Shaner, Las Vegas, Nev.; and three grandchildren. Funeral services will be 11 a.m. Saturday at Mortimore Funeral Home, conducted by the Rev. Ben Gum. Burial will be 2 p.m. Saturday at Riverside Cemetery, Cody, Wyo. 7484. “Ritchey Reed Shaner,” Find-A-Grave, https://www.findagrave.com/memorial/100994738, 100994738. 7485. “Dora Mabel Chapman Shaner,” Find-A-Grave, https://www.findagrave.com/memorial/92057592, 92057592. 7486. Ralph G Hurlbert and Dora Chapman, “Montana, County Marriages, 1865-1950,” September 9, 1919, Billings, Yellowstone County, MT, https://www.familysearch.org/ark:/61903/1:1:F33K-357. 7487. Stanley J Chapman and Ada M Patterson, “Montana, County Marriages, 1865-1950,” January 12, 1926, Billings, Yellowstone County, MT, https://www.familysearch.org/ark:/61903/1:1:F3QG-3Z9. 7488. Ritchey R Shaner and Dora Hurlburt, “Montana, County Marriages, 1865-1950,” April 16, 1928, Billings, Yellowstone County, MT, https://www.familysearch.org/ark:/61903/1:1:F3QL-496. 7489. 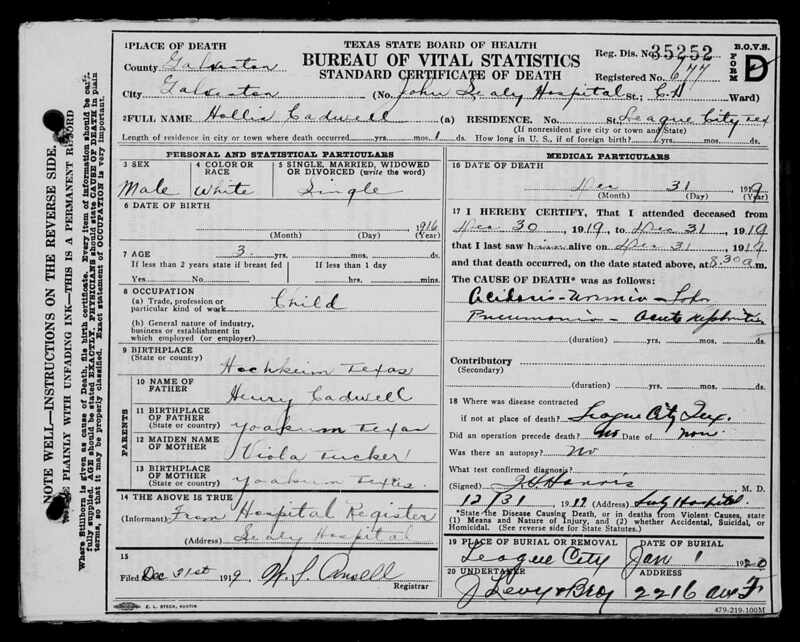 Max Chapman, “California Death Index, 1905-1939,” October 3, 1935, Fresno County, CA, 55785, https://www.familysearch.org/ark:/61903/1:1:QKSM-TC2H. 7490. “Annual Senior Recognition Exercises at Union College,” Sylvia Marilyn Ford and Marvin Victor Larson, Lincoln Journal Star, Lincoln, NE, February 17, 1951, 2. Arnold Young passed away Friday, June 25, 2010, in Olympia. He was born July 21, 1918 in Walton, Nebraska to Arthur and Anna Young. Arnold and wife, Ellen were long time residents of Onalaska before moving to Olympia.Arnold is survived by his son, Richard (Ruby), of Alaska; daughters Elizabeth Ely of Tumwater, and Cathy Taftezon-King (Steven) of Olympia; a brother, Donald Young and a sister Hazel Wisner both of Chehalis; 8 grandchildren; 16 great-grandchildren and 16 great-great-grandchildren. He will also be missed by loving nieces and nephews and family and friends. He was preceded in death by his wife Ellen, of 63 years, in 2004. Arnold served in Army during World War II. He was employed by C&E Mill in Randle and retired in 1980. He loved to fish, play cards and camp. Arnold also enjoyed his large garden and was still planting one in up to the age of 88. He enjoyed spending time with family and friends. Arnold and Ellen spent 20+ years wintering in Arizona with good friends. 7492. “Harold Baker Wisner,” Find-A-Grave, https://www.findagrave.com/memorial/61906562, 61906562. 7493. “Hazel K Wisner,” Find-A-Grave, https://www.findagrave.com/memorial/70010641, 70010641. 7494. “Obituary,” Hazel Katherina Wisner. 7496. 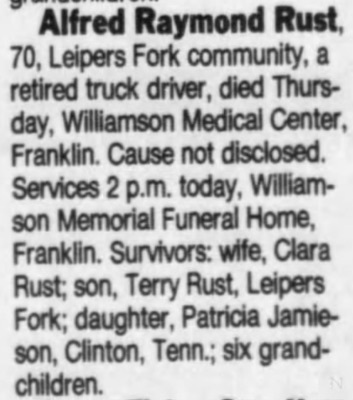 “Deaths,” Alfred Raymond Rust, The Tennessean, Nashville, TN, March 2, 1996, 17. Alfred Raymond Rust, 70, Leipers Fork community, a retired truck driver, died Thursday, Williamson Medical Center, Franklin. Cause not disclosed. Services 2 p.m. today, Williamson Memorial Funeral Home, Franklin. Survivors: wife, Clara Rust; son, Terry Rust, Leipers Fork; daughter, Patricia Jamieson, Clinton, Tenn.; six grandchildren. 7498. “Obituaries,” Dennis Harold Johnson, The Saskatoon StarPhoenix, Saskatoon, Saskatchewan, Canada, February 24, 2018. It is with sadness the family of Dennis Harold Johnson announce his passing after a lengthy illness. Dennis is survived by his loving wife, Vi; 6 children: Lorrie (Kim) Baryluk, Joel (Amanda) and Aaron; Vicki (Dwight) Seib, Jonathan (Kelsey), Andrew (Heather), Michael (Rachel) and Liam; Blair (Leah) Johnson, Andrew and Lucas; Mark (Tami) Johnson, Denver (Becky), Morgan (Leland) and Brooklyn (Bryce); Andrea (Ken), Jordan (JP) and Jacob; Brett (Heather) and Evan. They have also been blessed with 8 great- grandchildren: Harrison, Ronan, Kingston, Noah, Scarlett, Jetlan, Ruby, Duke. Dennis was born on July 15, 1937 to Harold and Margaret Johnson in Riverhurst, SK. He grew up across the river in Lucky Lake. He married Vi in 1957. They raised their 6 children in Lucky Lake until 1974 at which time they moved to Saskatoon. Dennis worked for Imperial Oil for a number of years and then as a construction contractor. As a young man Dennis was often found on the ball diamond or at the hockey rink and then later he enjoyed watching his children and grandchildren play as well. Dennis was a pillar of the family. He and Vi created a lifetime of memories with their children, grandchildren and great grandchildren. Though he will be sorely missed we rejoice at the full life lived and knowing that he is in Heaven with his Lord. In lieu of flowers, memorial donations may be received at Teen Challenge (12, 2155 Airport Drive, Saskatoon, SK S7L 6M5). A Celebration of Life will be held at 2:00 p.m. on Wednesday, February 28 at The Neighborhood Church (233 Pinehouse Drive, Saskatoon). Arrangements are in care of John Schachtel at Mourning Glory Funeral Services, (306) 978-5200 www.mourningglory.ca. 7499. Texas Deaths, 1890-1976, “Hollis Cadwell,” December 31, 1919, Galveston, Galveston County, TX, USA, https://www.familysearch.org/ark:/61903/1:1:K3D6-BRS. 7500. Viola Geneva Cadwell, “Texas Birth Index, 1903-1997,” July 6, 1914, Lavaca, TX, https://www.familysearch.org/ark:/61903/1:1:V83J-6YN.